Power Up your HTC – and still play Angry Birds! Aren’t the new smart phones amazing? How could we live without them? Play that game, listen to that tune, download that app, buy that shirt, find that restaurant, check in, post, follow and friend – if only it would make a cup of coffee! We demand so much of our smart phones these days with more functionality and slimmer, lighter casing and we still want longer battery life. With all that activity, the drain on our batteries can still leave us short on power. PowerSkins® have come up with a solution. These soft cases feature a built in battery that packs an additional 1500 mAh of power for your Android powered Smartphone. With twice the power for your Smart phone, the PowerSkin® will give you 340 minutes of extra talk time. They are available for the HTC Desire and the HTC HD7. The sleek design fits your phone like a skin, with openings for the camera lens and all ports. When you drop your phone or it gets knocked about – the silicone rubber protects your phone. Imagine life without it? Can’t? Then grab a PowerSkin® today. They’ve just arrived in Australia and are waiting to come protect your phone! Order now! PowerSkins® are also available for the BlackBerry, iPhone and Samsung. Check out our website for all the details and ‘Like’ us on Facebook to receive the latest updates! PowerSkins to hit Australia; Slip one on today! PowerSkins now available in Australia! They’re not called PowerSkins for nothing! Imagine being stuck on the train and your battery runs out – no music, no phone, no email. Or you’re about to snap a quick photo of your kids on holiday and the phone goes dead. Or you leave your charger at home and your battery is low at the office. We have the solution! Slip on a PowerSkin and recharge your phone in a matter of minutes. You’ll never be left short on power for your phone again! 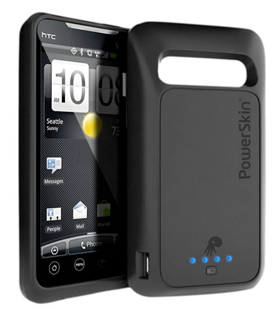 PowerSkin®, maker of shock-absorbing, battery-boosting smartphone cases, has announced the availability of skins for the HTC Inspire 4G and HTC Desire HD, boasting 1500 mAh of power. Mr Mobile is hot on the trail and has stock arriving in a few weeks for the BlackBerry, HTC and Samsung…..and of course the iPhone 4. PowerSkins® are made of flexible, silicone rubber that protects against those inevitable drops, and they feature technology that extends battery life up to 8 hours. Don’t be caught short again. At just $89.95 these will go fast – so make sure you pre-order today! Live from Computex in Taipei Mr Mobile looks at the full range of XPAL Powerskins for the HTC Desire, HTC Thunderbolt, HTC Sensation, Samsung and iPhone 4. With LED status light and on off switch, you’ll never be caught out again! We’ll have these in stock soon. So check out our website for details.